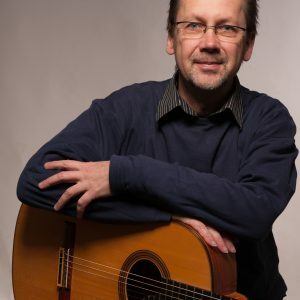 David Grimes has performed extensively throughout North America and Europe, and recent concert tours have taken him to Mexico, Greece, Bulgaria, Spain, Denmark, France, Norway, Malta, Belarus, Serbia and Montenegro. He has often been featured with chamber ensembles and with symphony orchestras, and he is frequently in demand at music festivals as a conductor and as a competition judge. David’s edition of Luys Milán: the Complete Fantasías and the celebrated series, Treasures of the Baroque, are published by Mel Bay Publications. His Mel Bay editions of The Complete Sor Studies and The Complete Giuliani Studies are staples of the teaching repertoire. 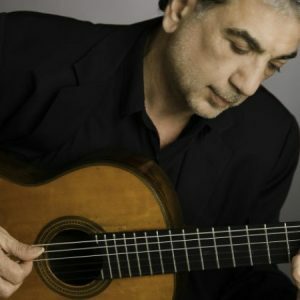 David’s own compositions are now being performed by prominent guitarists throughout the world. 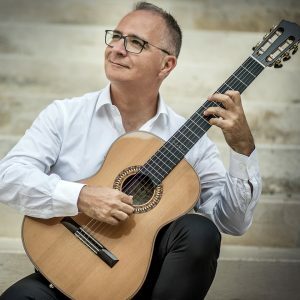 Early pieces, Preludio, Chorale and Tango appeared in Classical Guitar, and Rêverie et Valse was included in New Music for Guitar, published by Mel Bay. Two collections of his works, Islands and 24 Preludes are now published by Editions Doberman-Yppan. Highly respected as a teacher and coach, David was Director of Guitar Studies at California State University, Fullerton, where he developed one of the nation’s leading centers of guitar instruction. For eighteen years David was President of the Guitar Foundation of America and now remains as Reviews Editor for the journal Soundboard.